With a stay at Halina Hotel Avenida in Manila (Santa Cruz), you'll be a 4-minute drive from Quiapo Church and 9 minutes from Rizal Park. This hotel is 1.9 mi (3.1 km) from Manila Bay and 2 mi (3.1 km) from Manila Ocean Park. 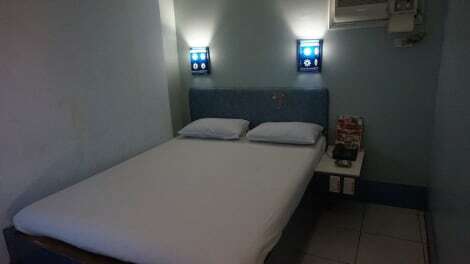 This cosy hotel in Manila is the best possible way to get to know the history, culture and charm of this vibrant city, as it is located in the centre of the picturesque district of Malate, with a wide range of points of interest, such as the Cultural Center of the Philippines and the Philippine International Convention Center. After a day exploring Metro Manila, guests will appreciate a well-deserved retreat at this hotel's guestrooms. This accommodation, which is decorated in an elegant Spanish-Mediterranean style, offers well-appointed and comfortable rooms with air-conditioning and complimentary wireless Internet access, as well as a cable television and an en-suite bathroom with a hot and cold shower and free use of underground parking. Enjoy a satisfying meal at Tambayan Gastrobar serving guests of Tambayan Capsule Hostel. Continental breakfasts are available daily from 6 AM to 10 AM for a fee. 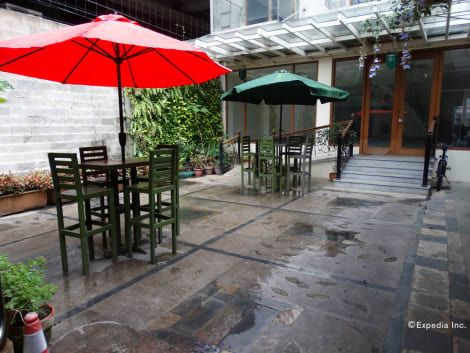 Located in Manila, Hotel 99 Quiapo is in the historical district, within a 15-minute drive of Rizal Park and U.S. Embassy. This hotel is 2 mi (3.2 km) from Manila Ocean Park and 2.3 mi (3.7 km) from Manila Bay. Make yourself at home in one of the 56 guestrooms. Complimentary wireless Internet access is available to keep you connected. Conveniences include desks and in-room massages, and housekeeping is provided daily. Make yourself at home in one of the 23 air-conditioned guestrooms. Complimentary wireless Internet access keeps you connected, and cable programming is available for your entertainment. Bathrooms have showers and hair dryers. Conveniences include desks, and housekeeping is provided daily. With a stay at ZEN Rooms Basic Quirino Station in Manila, you'll be 2.5 mi (3.9 km) from Manila Bay and 6.8 mi (11 km) from Venice Grand Canal Mall. This hotel is 8.1 mi (13 km) from SM North EDSA and 8.6 mi (13.8 km) from Fort Bonifacio. 1010 Vicente G. Cruz St. If you're a fan of fast-paced cities where there's always something new going on, you'll find it easy to fall in love with Manila. The capital of the Philippines is set on the edge of Manila Bay in the South China Sea, and is a hub for visitors to this region who come to take in the buzzing atmosphere, admire its many historic sights and make the most of its huge shopping malls. Here on the website you'll find a wide selection of Manila hotels to choose from, with accommodation options to suit all budgets. A walled part of the city known as the Intramuros district draws a large number of visitors and is one of Manila's major cultural hotspots. Start your visit here and take time to wander through the area's courtyards and dungeons, gunpowder rooms and churches. Much of the architecture here dates back to the 16th century. Although considerable damage was caused during the Second World War, Intramuros remains the best place to see Spanish-era influences in Manila. Step inside San Agustin Church while visiting Intramuros. Built in 1589, it is the oldest stone church in the Philippines and was recognised as a UNESCO World Heritage site in 1993. Fort Santiago guards the entrance to the Pasig River and is now filled with beautiful gardens and plazas, while nearby Rizal Park offers another chance to escape the bustling city streets. Manila Cathedral is certainly worth seeking out if you're in the mood for some quiet reflection. A few minutes' walk south-east of the cathedral lies the city's National Museum, where you'll find a wonderful collection of fine art, archaeological discoveries and natural history exhibits. Opportunities to shop are plentiful in Manila. Whether you're looking for local craft items offered up by street sellers, or fancy escaping the heat by wandering through an air-conditioned mall, you won't have far to travel. SM City Manila, located next door to City Hall, is a top retail destination where you'll find scores of national and international fashion retailers, electrical shops, a food court and a cinema. Robinsons Place Mall is a seven-level shopping complex within walking distance of Manila Bay. It's also filled with retailers, entertainment options and restaurants. If you're looking for a more traditional shopping experience and the chance to pick up some real bargains, consider swapping the air-conditioned tranquillity of the mall for the rough and ready street markets in the districts of Quiapo and Divisoria. No matter whether you're looking to sample some local Filipino delicacies or would prefer to stick with international cuisine, you'll find a great range of dining options in central Manila. For something quick and easy, fast food options including Jollibee (burgers) and Max's Restaurant (chicken) are dotted throughout the city. Binondo is known to as Manila's Chinatown district and is a great place to find quality, cheap eats. For tasty Mexican food try El Chupacabra, a trendy street café that has earned itself an impressive reputation. At the other end of the scale, you can enjoy fine dining at Spiral in the Sofitel Philippine Plaza, or My Kitchen on Belen Street, known for its wonderful Mediterranean food.